SurfMaui is pleased to announce his “Race for the Pennant Meet and Greet Magical Mystery Tour.” Yes, you can watch the Giants climb to the top of the National League West and at the same time actually have the rare opportunity get to meet and greet SurfMaui in person. SurfMaui will be available for personal appearances and to meet and greet all TWG posters before, after, or perhaps during games. (It’s just like “Kids Run the Bases Day,” except without either the Kids or the Bases). 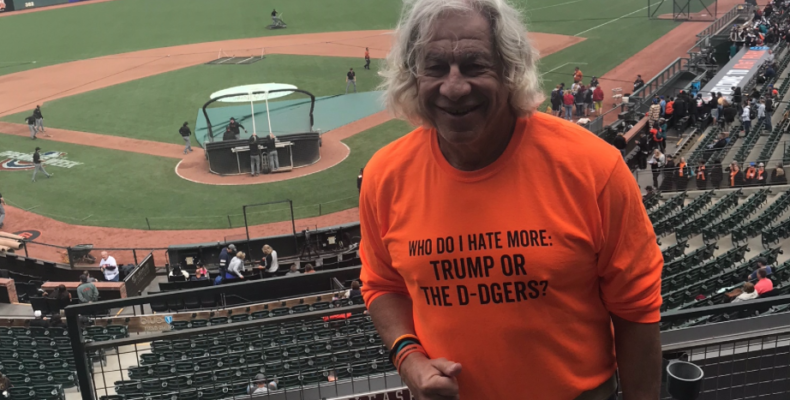 This is a limited opportunity to see the aging curmudgeonly Giants fan in the flesh, and to hear him pontificate on the State of the Giants, personnel decisions, and baseball strategy, without having to wait for his witty, thoughtful, and timely comments to be posted on the TWG. He may also regale you with tales–many of them even true– about seeing Willie Mays play in the Polo Grounds, getting a picture with Barry Bonds, meeting Mathew, and countless other inane stories. For a price he can even give you the inside scoop on Greek Giant. As an extra bonus, by the end of the trip the Giants should be at full strength with the return of Cueto, Samardzija, and Longoria and will be leaving the entails of rest of the Division in their vapor trail. There is no charge to “Meet SurfMaui” ™. However, because of the anticipated high demand for tickets, reservations are highly recommended You can send your requests along with contact information to kalamasurfer@gmail.com.